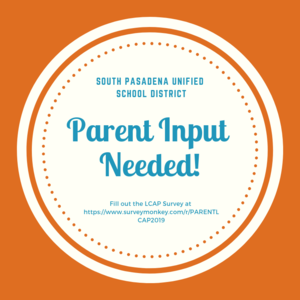 SOUTH PASADENA, Calif. (March 25, 2019) – South Pasadena Unified School District (SPUSD) is seeking input from parents/guardians in order to gather data about the impact programs and services are having on students. With specific emphasis on eight state-developed priorities, the Local Control Accountability Plan (LCAP) is updated annually prior to July 1 based, in part, on valued feedback received through the online survey. The eight state priorities guide school districts in determining goals for all pupils. The priorities are: basic services, implementation of California State Standards, parental involvement, student achievement, student engagement, school climate, course access and other student outcomes. 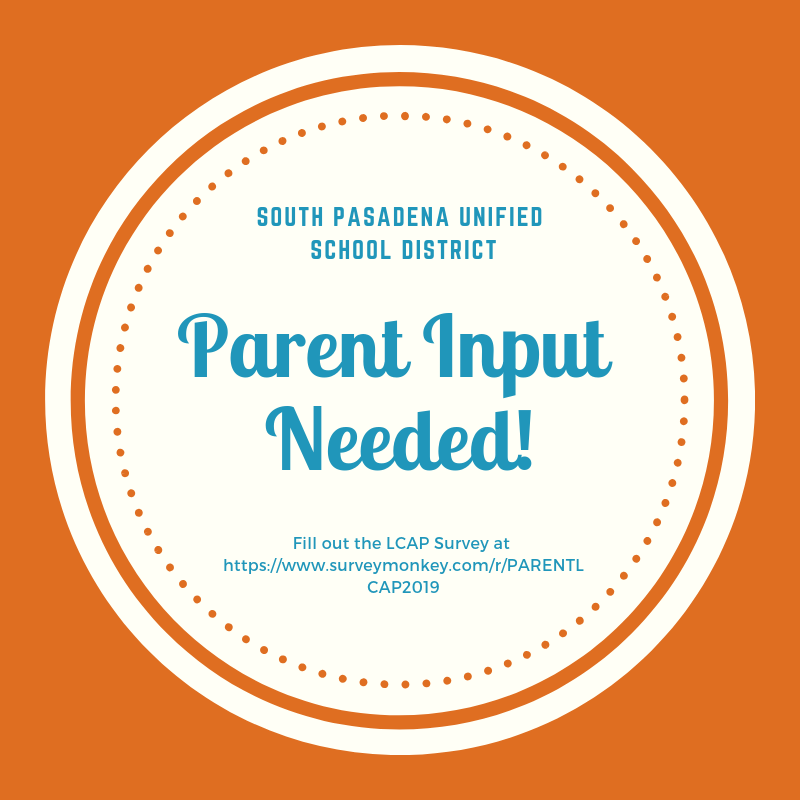 Parents and guardians are encouraged to fill out the 2019 LCAP Parent Survey using this link https://www.surveymonkey.com/r/PARENTLCAP2019 or by accessing the survey on the LCAP page under Instructional Services at www.spusd.net. Data collected will be used by administrators to update the LCAP in time for the next fiscal year. By early summer, district administrators should have a greater understanding of the state funding allocations that will be provided through the Governor’s 2019-2020 budget. The allocation will be lower than neighboring districts’ allocations, requiring a continued emphasis on local funding sources, including parcel taxes, bond measures and contributions to our non-profit educational foundation, SPEF, Booster Clubs and PTAs. The LCAP annual update is required by the Local Control Funding Formula (LCFF) legislation as a statewide approach designed to improve student outcomes. SPUSD will be thoughtful and deliberate in review of the budget and services available to all students, and parental input is key to the decision-making process.